We just experienced/witnessed the 3rd largest Bitcoin drawdown of -65.81% from the highs. In absolute dollars, this is the largest drawdown in Bitcoin history. The current price rut also happens to be the slowest sell-off we have ever faced. Bitcoin took on average 1.5x more days to recover to the previous highs than the NASDAQ Composite did during the tech boom. Based on the “Recovery to Trough Ratio” of 1.69 and 111 days peak to trough for the current drawdown, it may take another 188 days from the low (not until mid-October 2018) before we might near the $20K level again. Bitcoin drawdowns are sharper and faster than drawdowns during the NASDAQ tech bubble, but also take a shorter time before we reach a new peak. 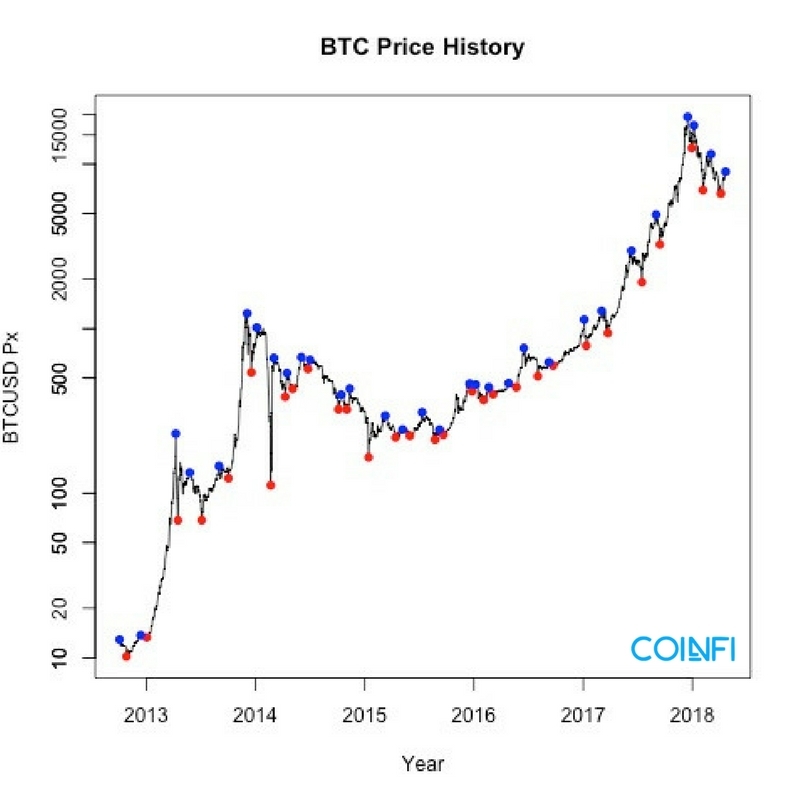 In recent days, we’ve seen a noticeable recovery in crypto prices. From Apr 1st, 2018 (when BTC hit an intraday low of $6463.54) until today (with BTC around $9240), Bitcoin has recovered 44%. While this is impressive, it’s still far from the $19k+ levels we saw in mid-December 2017. Will this price recovery last? How long will it take for us to return to the glory days of Bitcoin at near $20,000 USD levels? In this research piece, we will examine the drawdown history in BTC to see how this recent “long winter” compares to corrections in the past, and furthermore, we will compare this drawdown with drawdowns during the tech bubble to see if we can gain useful insights. The data we use for this piece will be BTC closing prices since Oct 2012, and NASDAQ Composite (the main benchmark for tech stocks) closing prices from 1996-2004, which encompasses the “tech bubble” period. 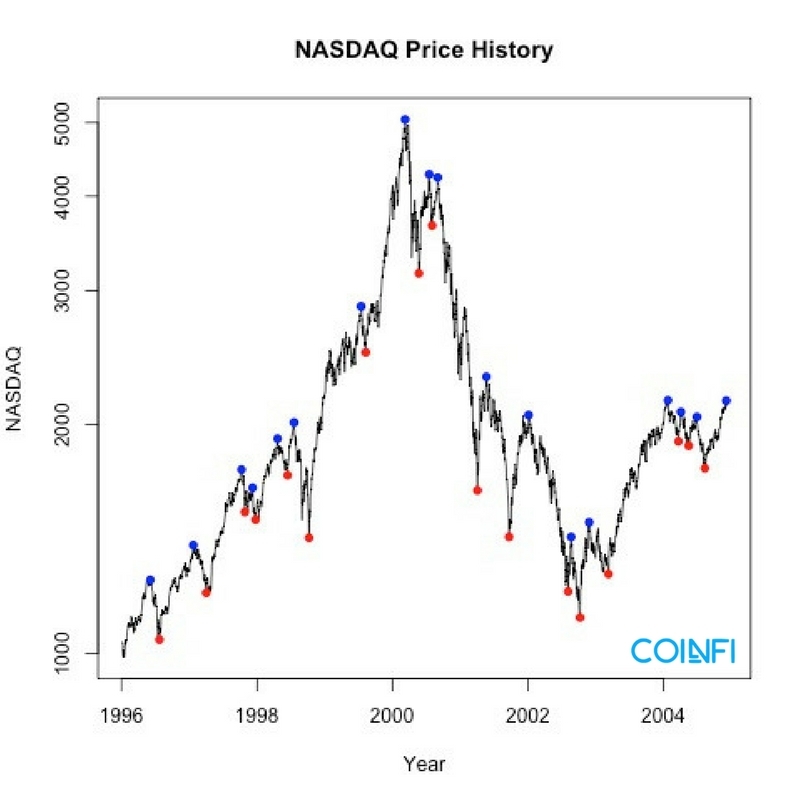 I know, I know, multiple articles out there have already made the comparison between Crypto and the NASDAQ Tech bubble, but here at CoinFi we wanted run this comparison for ourselves, and also take the analysis one step further to see if we could come up with new insights to share with you guys. First, let’s start with some basics. A drawdown in any asset is defined as the %price change from peak asset price to the bottom. We are currently in the 3rd largest drawdown (since BTC really became a thing) of -65.81% from the highs. This implies a $12,445.72 absolute price drop which is the largest ever drawdown in terms of absolute dollars. The average of these drawdowns is -49.24%, so the current drawdown of -65.81% is on the higher side than we previously witnessed, and one could make the argument that BTC is over-extended and unlikely to fall further. Interestingly, the current price rut that we are in also happens to be the slowest sell-off we have ever faced, taking 111 days to hit bottom. That’s nearly 3x the average of 41.28 days. It also explains why this recent drawdown feels particularly painful as crypto investors have been accustomed to fast rebounds. The “Recovery to To Trough Ratio” which compares how many days it takes to recover to the previous highs with the number of days it takes to hit the lows, has an average of 1.69 for all drawdowns. This is crucial as it implies that it takes 1.69x as many days to recover to the former highs as it did to hit the lowest point on average. You can see that the largest drawdown of -77.93% from March 13, 2000 to October 9, 2002 signals the bubble burst. Surprisingly it took 647 days for the tech crash to reach absolute lows and it wasn’t till April 23, 2015, a whopping 3155 trading days later, that we reached the same highs again. That’s a really, really long time to recovery. The average drawdown is -21.76% which is less than half that of BTC. Of course, this is something you could have guessed for yourself, given the higher volatility of crypto. On average, it took 102.8 days to hit the lows, which is 2.5x longer than what we observe in BTC. BTC has a “to Trough to Peak recovery ratio” that’s 1.5x slower than NASDAQ. This implies that for BTC, each day of drawdown took on average 1.5x more days to recover to the previous highs than the NASDAQ Composite did during the tech boom! Certainly an interesting find, although a bit of a depressing one for all the crypto enthusiasts and HODLers out there, as we expected a faster recovery time for a more volatile asset. So what does this info tell us? Despite the fact that people frequently draw comparison between the two, the drawdown behavior between the NASDAQ tech bubble and BTC are not that similar. Specifically given the decentralized nature of speculation and lack of institutional backing in Crypto vs Tech stocks, comparing the 2 is akin to comparing apple to oranges – despite the convenient narrative of bubbles in general. The big difference unfortunately is the relatively slower recovery period. With the “Recovery to Trough Ratio” at 1.69 for BTC and 111 days peak to trough for the most recent drawdown, we can imply simply that it may take another 188 days from the low before we might near the 20K level again. So according to this analysis, it might not be till mid October till you see your money back if you bought at the high, which is a lifetime in the crypto world! The variance between the drawdown statistics are large – there isn’t enough consistency between data points for us to draw firm conclusions. Most importantly, the data is severely distorted by the Mt Gox fiasco which triggered the largest ever BTC drawdown and an extremely long winter. To counter the above points, we have extended the analysis to examine not only peak to trough drawdowns, but also local minima and maxima – which gives us more data points. In the above graph, the blue points reflect the local peaks (maxima) and the red points represent the corresponding troughs (local minima). Furthermore, the average recovery to the next local peak is 119% showing that each average recovery more than doubles the previous low. We can do the same deeper analysis for NASDAQ during the tech boom to see how it compares. In an ideal world, we would have more data points and conduct some significance testing, but it is clear that BTC drawdowns are sharper and faster than drawdowns during the tech bubble, but also take a shorter time before we reach a new peak. Many have attributed the recent price recovery to the end of the tax season. While this recovery is certainly promising, and the crypto world is seeing positive developments such as increased institutional interest in the crypto world, I would caution our fellow readers that it may still be a bit longer than a few weeks before we see cryptos reach its former highs, but in the medium term the prospect is looking bright. Thanks Tim. Was wondering where you disappeared. Analysis like this restores my confidence in the team and a bright future for coinfi.